League of Legends and Dota 2—the free-to-play MOBA (multiplayer online battle arena) sensations, both playable on Mac—are two of the biggest competitive gaming draws today. Both have respectively yielded tens of millions of dollars in tournament prize pools, pulling in millions of viewers to their live-streamed championship events, and the intense fandom surrounding both games shows no signs of slowing. It’s indicative of a wider eSports boom, as games as diverse as Street Fighter and Call of Duty support large competitive communities in which top-skilled players battle it out online and at events around the world. And all of that is live-streamed online via portals like Twitch, where nearly 10 million people a day watch all kinds of gaming streams. Market intelligence firm Newzoo projects that some 385 million people worldwide will tune into eSports streams in 2017, with industry-wide revenues reaching $696 million. Vainglory hasn’t yet reached the peaks of those aforementioned games, but the iOS and Android-exclusive MOBA has quickly yielded a thriving and ever-expanding eSports community. December’s first-ever World Championships brought the 12 top teams to Los Angeles to compete for a $120,000 total prize pool, and now the world’s best Vainglory players are a few weeks into a new 2017 season. You might have played Vainglory—and you should, really, because it’s excellent—but high-level play looks a lot different than what you may be used to. These hardened pro players have mastered the characters’ abilities and work in tandem to take out enemy heroes and towers, generate precious resources, and ultimately destroy the rival base. Seeing that kind of tactical precision is impressive, and it may motivate you to up your own game. Curious what you’ve been missing? Even if you’ve never watched a competitive video game before, it’s easy to tune into the free online streams and start following the action. Here’s a look at how Vainglory works as an eSport, and more importantly, how you can begin watching. Vainglory’s 3-on-3 multiplayer team battles are perfect for pro competition, as the two opposing sides try to demolish the giant crystal in the enemy base. In between the bases is a line with automated defense turrets for each squad, as well as “creeps,” which are allied creatures aligned with each squad. Each team must gradually build momentum by defeating foes, smashing turrets, and amassing coins, and try to be the first to crush the enemy base. Every eSports match begins with a draft, in which each player selects his or her hero from the roster. As of this season in the official Vainglory 8 series, each team also picks two heroes that are banned across the board. This allows for some strategic maneuvering, as you can block heroes that are strong against your own picks, for example, or ban one that might be an ideal pairing with a rival’s hero. Vainglory is free and fun to play, but the competitive action is truly next-level. From there, the match starts, and that’s when we see team strategies unfold. Competitive play has three primary player roles that must be executed, with each player’s unique actions considered critical to their combined success. The Carry role is handled by a player who will spend most of his or her time in combat, killing creeps and enemy players alike. Doing so generates gold, which can then be spent on in-game items and equipment. Meanwhile, the Captain helps protect the Carry while directing tactics on the battlefield, while the third player is deemed the “Jungler.” This hero must go below the lane into the jungle area of the map, and try to disrupt the other team’s strategic and support plans while also attacking the rival Carry. Even if Vainglory is streamlined compared to Mac and PC MOBA hits, it’s still a lot to take in. Here’s a simpler take: when you watch pro Vainglory teams, you’re seeing them execute a tactical plan based on potentially thousands of hours of gameplay. When a top trio is in sync and they come together for tense full-team fight moments and swift victories, it’s thrilling to see. It’s a lot different than what you’ll experience while playing casual games with random people online, and you can take a lot of tips and tactics away from watching pros play. Developer Super Evil MegaCorp’s official league is called Vainglory 8, which evolved from last year’s Evil Eight series, and the current Spring 2017 season began in mid-March. The eight best teams apiece in North America and Europe battle it out online each weekend to earn points for series wins. After four weeks, the top five teams in each region get a weekend off—but the bottom three still need to fight. Vainglory 8 is where the best of the best play in each region. The Challenge Battles weekend that ensues allows the top teams outside of the Vainglory 8, who have proved their skill in lower-profile leagues (like VIS and VGL), to challenge those struggling Vainglory 8 squads. If the challenging team wins, it takes away that Vainglory 8 spot, along with the points the fallen team accrued so far in the season. Last year, a Challenger team named Avalanche made it to Europe’s Summer Championships and beat three-time winner Team Secret, so the threat from these hungry, under-the-radar teams is very real. With potentially new teams in the mix, the online battles resume for another three weeks before a second round of Challenge Battles, and then it’s on to the live finals. The Vainglory Spring 2017 Unified Championship will bring together the six best teams each from North America and Europe to battle it out across three days at The O2 Arena in London. It’ll take place from May 19 through 21, and everything will stream online for anyone not willing to cross the Atlantic. Vainglory’s live events are growing in size and visibility. The winning team will earn automatic entry into the live World Championship event, which is likely to take place near the end of the year. If last year’s format is any indication, then we should see Summer and Autumn seasons thereafter, with those winners also making it to Worlds. Meanwhile, the other teams at Worlds will come from separate Vainglory 8 and Challenger leagues being held in East Asia, Southeast Asia, and China. Last season’s world champion was Korean squad Phoenix Armada, now named Invincible Armada, which surprised runner-up Team SoloMid in the finals. The young trio of Willy, Mango, and druid won a cool $60,000 by winning four games to SoloMid’s two, and Armada has continued its stretch of success, ruling the East Asia standings with twice the points of the second-place team. Here’s a look at the World Championships, where Phoenix Armada won it all. It was a surprising upset, but aside from that stumble, Team SoloMid has been strongly dominant for a long stretch. The North American squad of BestChuckNa, VONC, and FlashX won the first NA split of this season’s Vainglory 8, and also won the NA Summer 2016 championship. 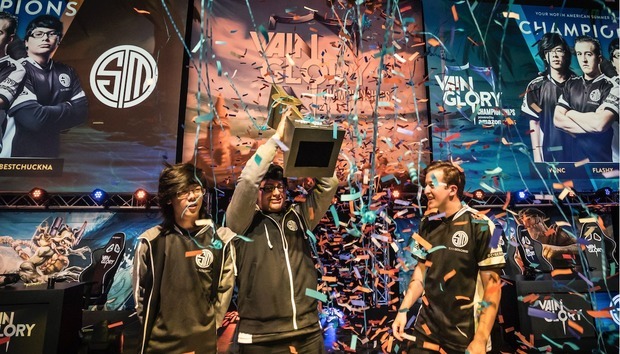 Team SoloMid is a large, multi-eSport organization, as is current NA runner-up Cloud9, which seems like the biggest threat to unseat SoloMid with its refreshed roster of gabevizzle, Oldskool, and iLoveJoseph. Over in Europe, the Cyclone and SK Gaming are ranked first and second, respectively, with the same overall tally of points, although G2 Esports—another large eSports organization—sits closely in third. The aforementioned Team Secret isn’t far behind in fourth place. As mentioned before, all of the live Vainglory 8 action during the season takes place on the weekends, and it’s available to stream online from the game’s official Twitch channel. You can watch via a web browser or the iOS app, however there’s no official Apple TV app. Each broadcast looks and feels a lot like watching a physical sport on TV, with a desk of analysts discussing the battle before and after it happens, while commentators break down every bit of action while you watch it on the screen. It’s amazing to see the kind of resources and expertise that go into the presentation, although to be honest, the analysis can be a lot to take in—they dig deep into techniques, strategies, and trends, but it’s also lively and personable. The best way to find out when streams are happening, whether it’s for the online season play or the larger live events, is probably to follow the official Vainglory Esports account on Twitter. And if you can’t watch the live streams, Super Evil MegaCorp makes saved videos of all of the matches available via both Twitch and the Vainglory Esports YouTube account. Vainglory viewership is on the rise and more major organizations are fielding teams this season, so the game’s eSports prospects are growing. True, it’s only played on smaller screens, but Vainglory makes a big impression with its competitive action. If you dig the game, then you’ll probably also enjoy watching the best players in the world battle it out. Tune in and give it a shot!